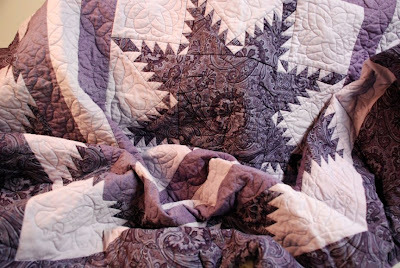 I love this purple lap quilt. My mother made it for her mother quite some time ago. It warms my heart to know it will soon find new life in the arms of my lifelong friend Julie….who has since childhood shared my grandmother’s unwavering ardor for purple. May she have many blissful naps and cozy evenings under these feathered, purple stars. How lovely. How beautiful, how precious that you would share such a treasure with your friend.